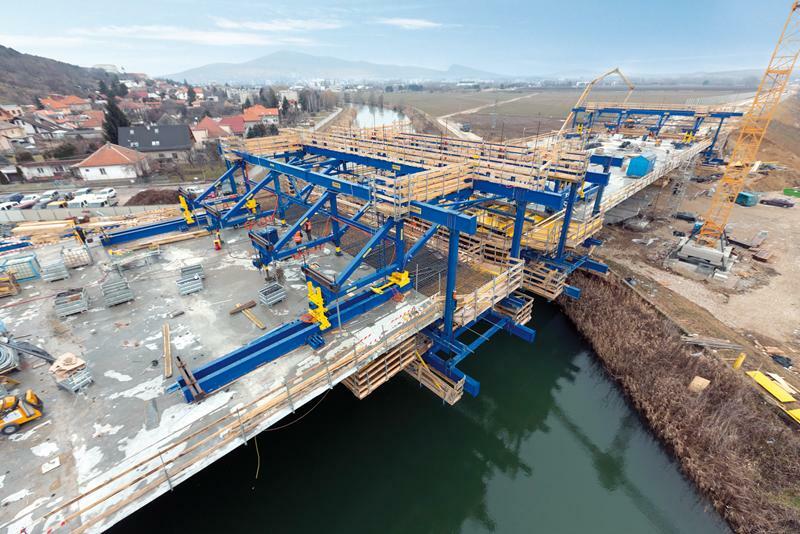 Doka cantilever forming traveller scores top marks for high adaptability and short cycle times on a massively dimensioned bridge superstructure in Nitra, Slovakia. The 52 km long extension of the R1 dual carriageway between the towns of Nitra and Banská Bystrica is one of the most extensive infrastructure projects currently underway in Slovakia, and is being implemented as a private-public partnership. 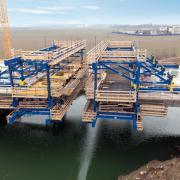 To close one of the last gaps in the new road in the Nitra-Selenec section, a 1165 m long bridge structure was built using a combination of the incremental launching and cantilevering methods. 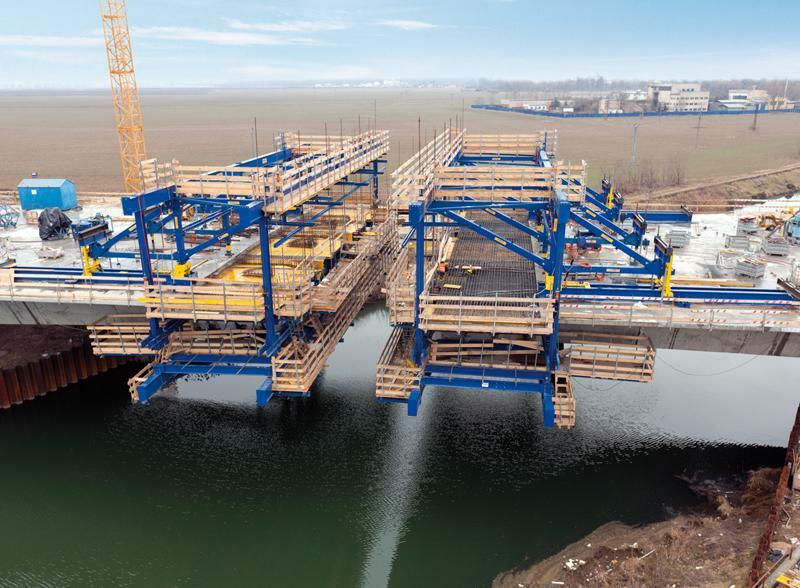 On the strength of its very positive experience on previous projects, the Hungarian bridge-building specialist A-Híd Építő decided to field high-performing Doka cantilever forming travellers. The extensive advisory and planning services offered by Doka, including verifiable statical calculation, and the high standard of – CE-certified – safety, were further decision-swaying factors for working with Doka once again. “All of us at A-Híd Építő Zrt. 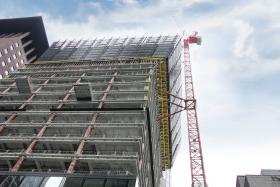 were highly impressed by the technology of the Doka cantilever forming traveller. The cycling operations all went smoothly and fast. In fact, working with it was not at all complicated! After concreting, the tensioning operations only took one day, and then the CFT never took more than one day to cycle”, points out Supervisor András Gyalog. 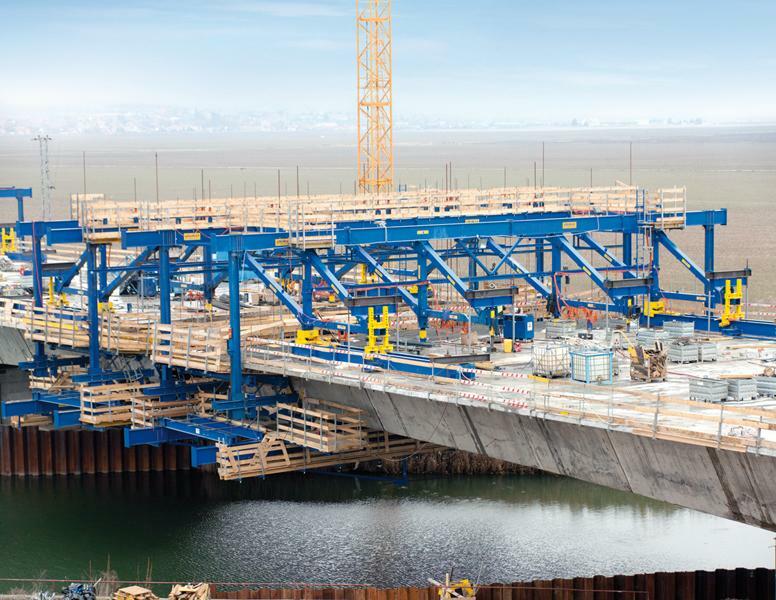 Due to the extremely large 26 m width of the superstructure deck, the Doka bridge specialists designed the cantilever forming travellers (CFTs) with four longitudinal trusses, from rentable components. The modular design concept of the CFT means that it can be adapted cost-efficiently, even to unusual superstructure cross-sections, using standard components. The specially developed tie-rod cross-girder ensures the very maximum of flexibility here. The tie-rods can be freely positioned in a tightly spaced grid anywhere along the entire length of the tie-rod cross girder, enabling them to be perfectly tailored to the bending moment. What is more, the unusually large cross-section meant much higher concrete loads, which also had to be allowed for when designing this CFT. 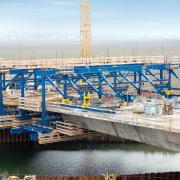 In the first of the 50 casting sections, the superstructure segments weigh a hefty 310 tonnes. Even though the cantilever forming travellers weighed 140 tonnes apiece, the use of newly-developed drive components – designed for maximised power and performance – allowed them to be travelled smoothly from one casting section to the next on the two outside longitudinal trusses. This made it possible to minimise the amount of equipment needed and ensure rapid cycling, despite the large influence width. To keep deformation of the bottom grid to a minimum during travelling, this was reinforced with a standardised undergirding support. The design of the inside formwork had to allow not only for a continuous reduction in the height of the superstructure deck, but also for a significant narrowing in the inside widths of the box-girder walls. To allow the modifications needed in every casting section to be accomplished as efficiently as possible, Large-area formwork Top 50 was mounted on movable custom profiles here, enabling it to be adjusted quickly, accurately and easily with heavy-duty screw jacks. 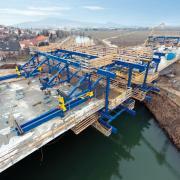 On this technically demanding project, the Doka cantilever forming travellers were a convincing solution in terms of safety as well, with features such as permanent self-locking to prevent unwanted travelling, safe access to all work-deck levels via integrated ladderways, and their fully railed-in work-platforms. As well as instructing the site crew in how to handle the formwork equipment correctly, an experienced Formwork Instructor from Magyar Doka was on hand to assist with erection of the CFTs on the pier-heads, and with the first travelling operation. This ensured safe, smooth forming operations right from the very first casting section. Despite the much more extensive reinforcing, forming and concreting works needed here than on a conventional superstructure, with the Doka cantilever forming traveller the well-practised site crew from A-Híd Építő was able to achieve an impressive eight-day cycle. “The construction progress was very successful. The plan was 10 days per section. The best result was 7 days per section, and the average was 8 days per section. Also, the pre-assembly only took 10 days, so Doka’s cantilever forming traveller definitely saved us a lot of time”, notes Supervisor András Gyalog, expressing his great satisfaction at the speed of construction progress. Thank you for your interest - Smooth progress of work despite extreme superstructure dimensions. Thank you very much for your interest - Smooth progress of work despite extreme superstructure dimensions.